I love those moments when my stomach growls loudly in the middle of a quiet room. Don’t you? Nothing embarrassing about that, right? It would normally happen to me during a Sunday morning church service because breakfast wore off and I was ready for lunch. I thought about hunger today as I was visiting a patient. This man is writing books about biblical matters as he wraps up his last days. His writing is primarily Scripture with minimal commentary. He asked me to read this aloud, so I did. I was reminded about how the Bible feeds the soul. My spirit fed off the countless verses he used to write these books. If you have weekend visitation with the Bible (or less), you’re starving. 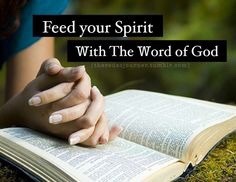 To those of you who are genuinely a child of God, you were designed to hunger for the meat of the Word. Without it, you become spiritually anemic and weak. You will have no spiritual muscles to fight the enemy or weather the trials of life. You can’t expect your preacher to “feed you”. I’ll blow a gasket if I hear someone say, “I’m not being fed.” I’m not much of a cook, but I never missed a meal when I was by myself. I fed myself some “gourmet” microwave meal or some “fine dining” from a fast food establishment. This physique didn’t come from not “being fed”. Just like we take the initiative to feed ourselves physically, it is our responsibility to do so spiritually. Starving or being spiritually healthy? It’s your choice. I hope you choose the latter. Amen-Amein Brother in Christ Jesus-Yeshua Matthew!! God Bless you and your Family members and Friends!! I Love you all Everyone through Jesus-Yeshua Christ, because HE LOVED 💕 EVERYONE FIRST! Spot on, Matthew. It is crucial for believers to be in the Word daily. You are on a roll! Preach it for sure. Reblogged this on Antioch Baptist Church.